John Kerry plays guitar for Chinese diplomats as news breaks that terrorist in Iraq have stolen uranium from a university. So let’s see, Israel is blowing the hell out of everything that moves, Syria is chaos defined, Russia and Iran are filling the gaping hole of support for Iraq left behind by the Obama administrations deadline exit. And now we find out that terrorist have taken 40 kilograms (88 pounds) of scientific uranium from a University. 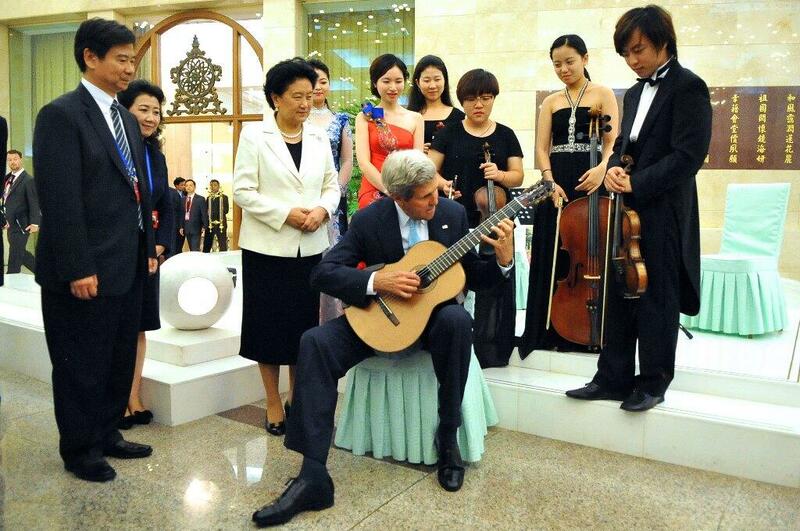 But all the world should rest easy knowing John Kerry can shred! 18 Comments on "Nero Fiddles As Rome Burns"
Considering the lack of response to this post, no one here cares either. Thanks for bringing this to our attention. The world is crumbling before our eyes and we are ignoring it. You are keeping your eye on the ball. Israel is the focal point and their iron dome system is doing exactly what the bible said it would do. When will the rest of the world realize they are truly God’s chosen people? He’s probably playing some “genuine” American folk music, either “Joe Hill” or “Buddy Can You Spare a Dime.” His audience seems to be displaying the proper decorum, but they must be thinking that if this is the US Secretary of State, then the US must be a nation of idiots. I am God’s chosen people! Why would God choose people who deny Him? I care nothing about the Middle East and its people. Neither side has any good will towards us anyway, except the Israel and that’s only because they are on US welfare. My only concern is the ability of nuclear weapons to strike people and places I care about. My secondary concern is our ability to decontaminate Middle East oil should the need arise. My tertiary concern is the continuing ~$3 billion per year we send to Israel in welfare with nothing to show for it. My country’s friends are not those who continue to leech off of us. If the end times are coming, it can start there. As long as he’s playin’ the geetar, he’s harmless. A stable Iraq was in place, but we had no desire to keep it. It would have taken nothing for us to defeat 800 ISIS terrorists in comparison to the terrorist state that is now forming. Even worse, we had the leadership in prison. We let them go. Now we are making the same mistakes in Afghanistan. Will we waste our blood and treasurer because we want a meaningless slogan of zero troops by 2016? You keep the bases to be a back up and keep terrorism at bay. It was a retweet worthy picture. Speaking of fiddling while Rome is burning. The President is apparently coming to Delaware next week to tout the old “roads and bridges” routine with the damaged I- 495 section as a back drop. Man if I hear one more Democrat spouting out the “roads and bridges” mantra, I’m going to have to take a long swim in the ocean. Everyone knows this is all just a dog and pony show leading up to a press for a new stimulus bill. I guess they are counting on us to forget about the last stimulus package where they said they would fix the “roads and bridges” but didn’t. Remember when Robert Reich voiced his opinion that “white construction workers” shouldn’t get the jobs that resulted from the stimulus. Well, I guess he eventually took solace in the fact that no construction workers actually got the jobs. Where have you been? The waste of blood and treasure has been obvious for the past 11 years. First, let’s be clear. The real danger here now is the use of a dirty bomb anywhere in the world, including the U.S.
Let me tie the two points together. Pres. 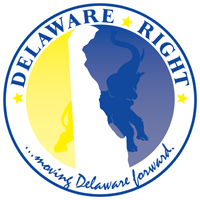 Obama will come and look at a bridge in Delaware that was allowed to fail, for a photo opp. Yet he would not go to the Texas border, the reason? He didn’t want it to be just a photo opp. We have a crisis on our southern border of thousands of “children” flooding in. Now there is uranium in the possession of terrorist. How hard could it possibly be for those terrorist to come across the southern border while our focus is drawn to Texas and children? The John Kerry photo is only a demonstration of how this administration has never had its eye on the ball when it comes to national security. They have played to their base by removing all troops from hard won locations. Look to history. Germany and Japan are world shaping democracies toady, not because we went, we won, and we left. No they survive as economic powerhouses and democratic bulwarks because the Allies stayed and supported them to this day in many senses. Pres. Obama is only concerned with his legacy among his supporters, history will judge him harshly in my opinion, if there is anyone left to judge. So, your complaint would be that the border is a more important photo op? Ok. Point taken. Regarding the border: ““No, I don’t support a fence on the border,” Rick Perry, 9/4/2011. The cost of complying with the Secure Fence Act’s mandate, is estimated at$4.1 billion, or more than the Border Patrol’s entire annual budget of $3.55 billion. Got any answers? Including where the money is coming from? Perhaps if we had opted for border fence building instead of nation building in Iraq, the $4 billion would have fairly easy to obtain. So what now? What’s your solution? No Dave, the point is the border issue is more important to national security than is the 495 bridge. The photo opp at the bridge will play much better than the one on the border would have, so he chooses to come here. The Socialist-Democrats told us that the original “stimulus” would create millions of “shovel-ready jobs.” What happened? Oh, they must have meant shoveling fries at a fast food joint. You say we should have stayed in Iraq ? How many more U.S. (4,486) and Iraqi(???) dead do you want ? Delacrat, how many Iraqis are dying right now because we left? And if the uranium ends up in a U.S. city as a dirty bomb, how many of our citizens will die? I did point out that after WW II we stayed in the countries we had destroyed and helped them to rebuild and recover. If we had pulled out of Germany and Japan on a time table as the Obama administration did in Iraq and is doing in Afghanistan, how long would either of them survived before either remnants of their former governments again assumed control, or the Soviets moved in. You cannot create chaos and then just walk away because you set the chairs back up around the table. Ah yes, the WMD myth. It never dies. I would point out that Japan and Germany had the good sense to stay out of the Iraq war and didn’t send 4,486 of their soldiers to early graves. Speaking of 4,486 dead, you never did answer my question about how many more GI’s you want dead in Iraq, how come ? Well, yes we can. The capacity to destroy does not imply the capacity (or intent) to rebuild. 11 years in Iraq demonstrates that. Delacrat says, “Frank, Recall we were killing Iraqis before we left”. Well were we? Or more likely we were killing outside insurgents coming there to kill American soldiers. “Ah yes, the WMD myth. It never dies.” The uranium was stolen from a university that used it for scientific purposes, no one said anything about WMDs, other than you pulling from your playbook. The report came from Iraqis through the U.N., not from the U.S..
As for your statement, “I would point out that Japan and Germany had the good sense to stay out of the Iraq war”. Actually Japan sent 500-700 non-combat troops to Iraq in 2003, they were non-combat due to the Article 9 of the Japanese constitution which prohibits their troops from waging war overseas. And Germany along with Japan were in Iraq as part of the NATO Training Mission. You then ask the loaded question of me, ” how many more GI’s you want dead in Iraq,” that is an easy answer my friend, I want none dead anywhere. But history and real life tells us that soldiers die, if not there would be no need for soldiers. What history also says is that if you go into a country and create chaos and then leave, this is exactly what you can expect. My point of Germany and Japan is that history shows that when necessary a nation can go into another nation to take out dictators and if they invest the time and the money, and yes the lives, then we can build lasting allies that work with us to forward freedom around the world. But we had not yet rebuilt Iraq to the point of standing on its own. We had set the chairs back up around the tables, we had straightened the pictures on the walls, we had dusted the knick-knacks, but we had not allowed the paint to dry. We ran the rats out, but didn’t invest the time to stay and block up the holes so they couldn’t come back in. We were not good stewards of that which we had created, and why? Because Pres. Obama was more interested in meeting an arbitrary deadline rather than actual results. Whooa….You lost me there pal. Even Bush II when asked how many civilians we had killed in Iraq, he said 30K. No one ever said they were “outside insurgents”. That’s the problem with “conservatives”. Whenever there are no obviously facts to support your argument, you just make “facts” up. WOOOOOO! That’s the problem with liberals, when you try to have a conversation with them they go off the deep end. No one said there was never any collateral damage. I am waiting for some brilliant liberal to invent the “CLEAN” war where no one dies. As for the “civilian” deaths in Iraq? Well considering we were fighting people who did not wear uniforms, to know who was who in real time for our soldiers was hard enough, but now you are telling me you can tell that they were all innocents? Okay!